The Book of Jonah is one of the Minor Prophets in the Bible. It tells of a Hebrew prophet named Jonah son of Amittai who is sent by God to prophesy the destruction of Nineveh but tries to escape the divine mission. Set in the reign of Jeroboam II (786–746 BC), it was probably written in the post-exilic period, sometime between the late 5th to early 4th century BC. The story has an interesting interpretive history (see below) and has become well-known through popular children's stories. In Judaism it is the Haftarah for the afternoon of Yom Kippur due to its story of God's willingness to forgive those who repent. 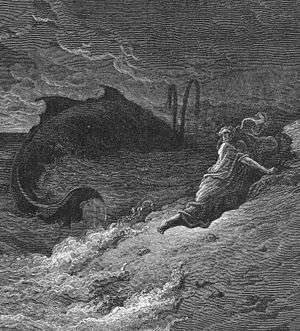 Unlike the other Prophets, the book of Jonah is almost entirely narrative, with the exception of the psalm in chapter 2. The actual prophetic word against Nineveh is given only in passing through the narrative. As with any good narrative, the story of Jonah has a setting, characters, a plot, and themes. It also relies heavily on such literary devices as irony. Nineveh, where Jonah preached, was the capital of the ancient Assyrian empire, which fell to the Babylonians and the Medes in 612 BC. The book itself calls Nineveh a “great city,” referring to its size [Jonah 3:3 + 4:11] and perhaps to its affluence as well. (The story of the city’s deliverance from judgment may reflect an older tradition dating back to the 8th–7th century BC) Assyria often opposed Israel and eventually took the Israelites captive in 722–721 BC (see History of ancient Israel and Judah). The Assyrian oppression against the Israelites can be seen in the bitter prophecies of Nahum. The story of Jonah is a drama between a passive man and an active God. Jonah, whose name literally means "dove," is introduced to the reader in the very first verse. The name is decisive. While many other prophets had heroic names (e.g., Isaiah means "God has saved"), Jonah's name carries with it an element of passivity. Jonah's passive character is contrasted with the other main character: Yahweh. God's character is altogether active. While Jonah flees, God pursues. While Jonah falls, God lifts up. The character of God in the story is progressively revealed through the use of irony. In the first part of the book, God is depicted as relentless and wrathful; in the second part of the book, He is revealed to be truly loving and merciful. The other characters of the story include the sailors in chapter 1 and the people of Nineveh in chapter 3. These characters are also contrasted to Jonah's passivity. While Jonah sleeps in the hull, the sailors pray and try to save the ship from the storm (1:4–6). While Jonah passively finds himself forced to act under the Divine Will, the people of Nineveh actively petition God to change his mind. The plot centers on a conflict between Jonah and God. God calls Jonah to proclaim judgment to Nineveh, but Jonah resists and attempts to flee. He goes to Joppa and boards a ship bound for Tarshish. God calls up a great storm at sea, and the ship's crew cast Jonah overboard in an attempt to appease God. A great sea creature sent by God, swallows Jonah. For three days and three nights Jonah languishes inside the fish's belly. He says a prayer in which he repents for his disobedience and thanks God for His mercy. God speaks to the fish, which vomits out Jonah safely on dry land. After his rescue, Jonah obeys the call to prophesy against Nineveh, causing the people of the city to repent and God to forgive them. Jonah is furious, however, and angrily tells God that this is the reason he tried to flee from Him, as he knew Him to be a just and merciful God. He then beseeches God to kill him, a request which is denied when God causes a tree to grow over him, giving him shade. Initially grateful, Jonah's anger returns the next day, when God sends a worm to eat the plant, withering it, and he tells God that it would be better if he were dead. God then points out: "You are concerned about the bush, for which you did not labour and which you did not grow; it came into being in a night and perished in a night. And should I not be concerned about Nineveh, that great city, in which there are more than a hundred and twenty thousand people who do not know their right hand from their left, and also many animals? (NRSV)"
Ironically, the relentless God demonstrated in the first chapter becomes the merciful God in the last two chapters (see 3:10). Equally ironic, despite not wanting to go to Nineveh and follow God's calling, Jonah becomes one of the most effective prophets of God. As a result of his preaching, the entire population of Nineveh repents before the Lord and is spared destruction. The author indicates that the city "has more than a hundred and twenty thousand people who cannot tell their right hand from their left" (4:11a, NIV). While some commentators see this number (120,000) as a somewhat pejorative reference to ignorant or backward Ninevites, most commentators take it to refer to young infants, thus implying a population considerably larger than 120,000. 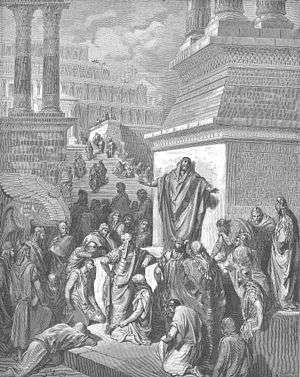 Jonah preaching to the Ninevites, by Gustave Doré. Jonah Cast Forth By The Whale, by Gustave Doré. The story of Jonah has numerous theological implications, and this has long been recognized. In early translations of the Hebrew Bible, Jewish translators tended to remove anthropomorphic imagery in order to prevent the reader from misunderstanding the ancient texts. This tendency is evidenced in both the Aramaic translations (e.g. the Targums) and the Greek translations (e.g. the Septuagint). As far as the Book of Jonah is concerned, Targum Jonah offers a good example of this. In Jonah 1:6, the Masoretic Text (MT) reads, "...perhaps God will pay heed to us...." Targum Jonah translates this passage as: "...perhaps there will be mercy from the Lord upon us...." The captain's proposal is no longer an attempt to change the divine will; it is an attempt to appeal to divine mercy. Furthermore, in Jonah 3:9, the MT reads, "Who knows, God may turn and relent [lit. repent]?" Targum Jonah translates this as, "Whoever knows that there are sins on his conscience let him repent of them and we will be pitied before the Lord." God does not change His mind; He shows pity. Fragments of the book were found among the Dead Sea Scrolls (DSS) (4Q76 a.k.a. 4QMinorProphetsa, Col V-VI, frags. 21–22; 4Q81 a.k.a. 4QMinorProphetsf, Col I and II; and 4Q82 a.k.a. 4QMinorProphetsg, Frags. 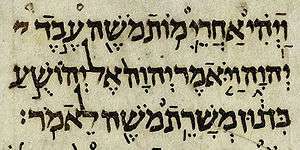 76–91), most of which follows the Masoretic Text closely and with Mur XII reproducing a large portion of the text. As for the non-canonical writings, the majority of references to biblical texts were made by argumentum ad verecundiam. The Book of Jonah appears to have served less purpose in the Qumran community than other texts, as the writings make no references to it. The earliest Christian interpretations of Jonah are found in the Gospel of Matthew (see Matthew 12:38–42 and 16:1–4) and the Gospel of Luke (see Luke 11:29–32). Both Matthew and Luke record a tradition of Jesus’ interpretation of the Book of Jonah (notably, Matthew includes two very similar traditions in chapters 12 and 16). As with most Old Testament interpretations found in the New Testament, Jesus’ interpretation is primarily “typological” (see Typology (theology)). Jonah becomes a “type” for Jesus. Jonah spent three days in the belly of the fish; Jesus will spend three days in the grave. Here, Jesus plays on the imagery of Sheol found in Jonah’s prayer. While Jonah metaphorically declared, “Out of the belly of Sheol I cried,” Jesus will literally be in the belly of Sheol. Finally, Jesus compares his generation to the people of Nineveh. Jesus fulfills his role as a type of Jonah, however his generation fails to fulfill its role as a type of Nineveh. Nineveh repented, but Jesus' generation, which has seen and heard one even greater than Jonah, fails to repent. Through his typological interpretation of the Book of Jonah, Jesus has weighed his generation and found it wanting. “In the next place, what are we to believe concerning Jonah, who is said to have been three days in a whale’s belly? The thing is utterly improbable and incredible, that a man swallowed with his clothes on should have existed in the inside of a fish. If, however, the story is figurative, be pleased to explain it. Again, what is meant by the story that a gourd sprang up above the head of Jonah after he was vomited by the fish? What was the cause of this gourd’s growth?” Questions such as these I have seen discussed by Pagans amidst loud laughter, and with great scorn. Augustine responds that if one is to question one miracle, then one should question all miracles as well (section 31). Nevertheless, despite his apologetic, Augustine views the story of Jonah as a figure for Christ. For example, he writes: "As, therefore, Jonah passed from the ship to the belly of the whale, so Christ passed from the cross to the sepulchre, or into the abyss of death. And as Jonah suffered this for the sake of those who were endangered by the storm, so Christ suffered for the sake of those who are tossed on the waves of this world." Augustine credits his allegorical interpretation to the interpretation of Christ himself (Matt. 12:39,40), and he allows for other interpretations as long as they are in line with Christ's. The Ordinary Gloss, or Glossa Ordinaria, was the most important Christian commentary on the Bible in the later Middle Ages. "The Gloss on Jonah relies almost exclusively on Jerome’s commentary on Jonah (c. 396), so its Latin often has a tone of urbane classicism. But the Gloss also chops up, compresses, and rearranges Jerome with a carnivalesque glee and scholastic directness that renders the Latin authentically medieval." "The Ordinary Gloss on Jonah" has been translated into English and printed in a format that emulates the first printing of the Gloss. The relationship between Jonah and his fellow Jews is ambivalent, and complicated by the Gloss's tendency to read Jonah as an allegorical prefiguration of Jesus Christ. While some glosses in isolation seem crudely supersessionist (“The foreskin believes while the circumcision remains unfaithful”), the prevailing allegorical tendency is to attribute Jonah’s recalcitrance to his abiding love for his own people and his insistence that God’s promises to Israel not be overridden by a lenient policy toward the Ninevites. For the glossator, Jonah’s pro-Israel motivations correspond to Christ’s demurral in the Garden of Gethsemane (“My Father, if it be possible, let this chalice pass from me” [Matt. 26:39]) and the Gospel of Matthew’s and Paul’s insistence that “salvation is from the Jews” (Jn. 4:22). While in the Gloss the plot of Jonah prefigures how God will extend salvation to the nations, it also makes abundantly clear—as some medieval commentaries on the Gospel of John do not—that Jonah and Jesus are Jews, and that they make decisions of salvation-historical consequence as Jews. Roman Catholic author Terry Eagleton has written, "There are writers who consider their work to be examples of high seriousness when they are hilariously, unintentionally funny. ... Another example is the Book of Jonah, which is probably not intended to be funny but which is brilliantly comic without seeming to be aware of it." Jonah and the "big fish"
The Hebrew text of Jonah 2:1 (1:17 in English translation), reads dag gadol (Hebrew: דג גדול), which literally means "great fish." The Septuagint translates this into Greek as ketos megas, (Greek: κητος μεγας), "huge fish"; in Greek mythology the term was closely associated with sea monsters. Saint Jerome later translated the Greek phrase as piscis granda in his Latin Vulgate, and as cetus in Matthew 12:40. At some point, cetus became synonymous with whale (cf. cetyl alcohol, which is alcohol derived from whales). In his 1534 translation, William Tyndale translated the phrase in Jonah 2:1 as "greate fyshe," and he translated the word ketos (Greek) or cetus (Latin) in Matthew 12:40 as "whale". Tyndale's translation was later followed by the translators of the King James Version of 1611 and has enjoyed general acceptance in English translations. In the line 2:1 the book refers to the fish as dag gadol, "great fish", in the masculine. However, in the 2:2, it changes the gender to daga, meaning female fish. The verses therefore read: "And the lord provided a great fish (dag gadol, masculine) for Jonah, and it swallowed him, and Jonah sat in the belly of the fish (still male) for three days and nights; then, from the belly of the (daga, female) fish, Jonah began to pray." The peculiarity of this change of gender led the later rabbis to reason that this means Jonah was comfortable in the roomy male fish, so he didn't pray, but that God then transferred him to a smaller, female fish, in which the prophet was uncomfortable, so that he prayed. Some biblical scholars believe Jonah's prayer (Jonah 2:2–9) to be a later addition to the story (see Source criticism (biblical studies) for more information on how such conclusions are drawn). Despite questions of its source, the prayer carries out an important function in the narrative as a whole. The prayer is a psalm of thanksgiving, serving to interpret Jonah's swallowing by the fish as an act of Divine salvation. God has lifted Jonah out of Sheol and set him on the path to carry out His will. The story of descent (from Israel, to Tarshish, to the sea, to under the sea) becomes the story of ascent (from the belly of the fish, to land, to the city of Nineveh). Thus, the use of a psalm creates an important theological point. In the popular understanding of Jonah, the fish is interpreted to be the low point of the story. Yet even the fish is an instrument of God's sovereignty and salvation. The book closes abruptly (Jonah 4) with an epistolary warning based on the emblematic trope of a fast-growing vine present in Persian narratives, and popularized in fables such as The Gourd and the Palm-tree during the Renaissance, for example by Andrea Alciato. St. Jerome differed with St. Augustine in his Latin translation of the plant known in Hebrew as קיקיון (qīqayōn), using hedera (from the Greek, meaning "ivy") over the more common Latin cucurbita, "gourd", from which the English word gourd (Old French coorde, couhourde) is derived. The Renaissance humanist artist Albrecht Dürer memorialized Jerome's decision to use an analogical type of Christ's "I am the Vine, you are the branches" in his woodcut Saint Jerome in His Study. ↑ Mercer Dictionary of the Bible. ↑ "Archived copy". Archived from the original on 2008-11-18. Retrieved 2009-08-18. United Jewish Communities (UJC), "Jonah's Path and the Message of Yom Kippur." ↑ David L. Washburn, A Catalog of Biblical Passages in the Dead Sea Scrolls (Brill, 2003), 146. ↑ Ryan McDermott, trans., "The Ordinary Gloss on Jonah," PMLA 128.2 (2013): 424–38. ↑ "The Ordinary Gloss on Jonah". ↑ Eagleton, Terry (2013). How to Read Literature. New Haven: Yale University Press. p. 134. ISBN 978-0-300-19096-0. De La Torre, Miguel A., "Liberating Jonah: Toward a Biblical Ethics of Reconciliation," Orbis Books, 2007. An English translation of the most important medieval Christian commentary on Jonah, "The Ordinary Gloss on Jonah," PMLA 128.2 (2013): 424–38.